Front panels for 1/2 size coat. Back panels for 1/2 size coat. Sleeves for 1/2 size coat. 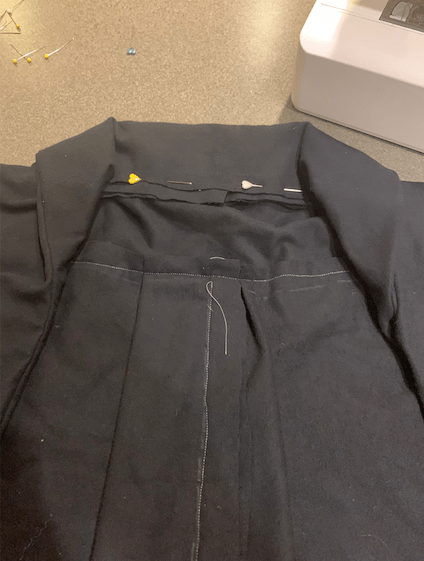 Collar insert for 1/2 size coat. Sleeves ready to be sewn. It did not work out very well! I expected this to happen which is why I made the smaller version. 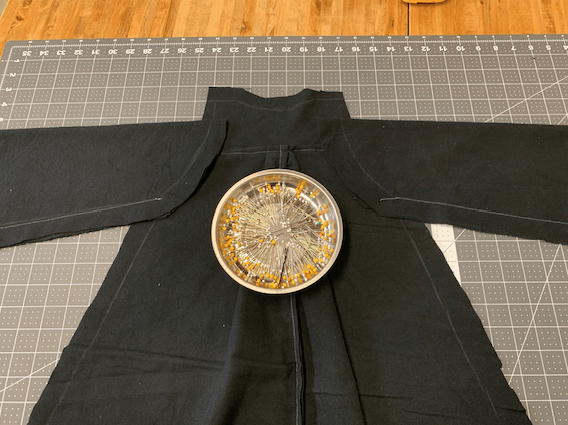 The main problem was around the collar area which has been the hardest portion to work out throughout this entire design process. The collar ended up with way too much fabric because the shoulder part somehow ended up way too small and the collar was too big. 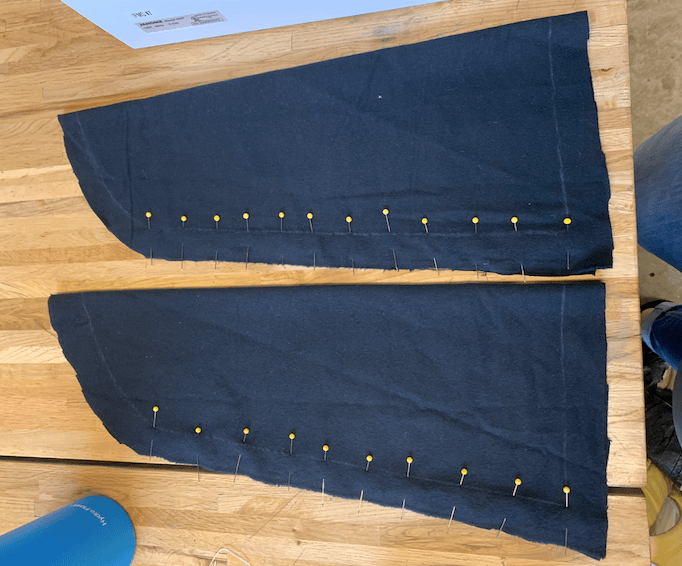 I decided to make a full size version of the top section of the coat (like a short vest) because this was where all of the problems were with the dimensions. This version worked out pretty well! I still need to change some of the dimensions to make the collar better but it is way better than where it was. Now I just need to make the full size paper cutouts, buy some good quality fabric, and sew everything together! 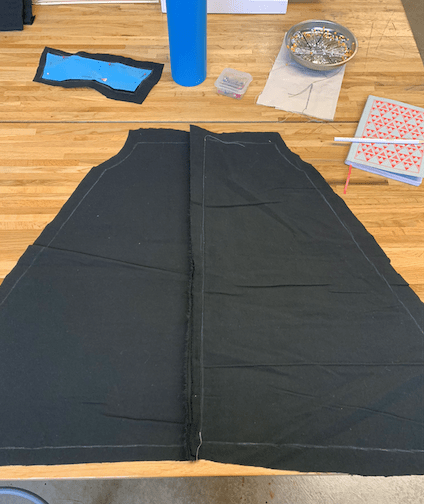 This sounds simple but it will probably take a lot of time seeing as how the small coat took me a couple hours to sew. Might have to get the fabric dry cleaned to make sure the fabric won’t shrink in the future. This includes sewing, ironing, and trimming the extra fabric plus any other unknown unknowns that might occur. It seems like you are pretty well on track. Preemptively cleaning the fabric to prevent shrinkage is clever. I am curious if the construction times of the 1/2 size coat and the full size coat will be linearly related. I would also recommend, and not just because I am currently typing this on a laptop sitting atop one, that you should consider laser-cutting the fabric. It allows for cutting multiple pieces at a time and would potentially save you some stress and error. I have been making bow ties that way for a while and it has eliminated one of my least favorite parts of working with fabric. The machines are limited in their size, so the pieces have to be smaller than 36″ x 24″. Your timeline is really well put together. It was also nice to see your progress thus far. Are you worried at all that your fabric might arrive later than 4/12? if so do you have a backup plan?